Start great with the Micromotors Ivory Silk Line! 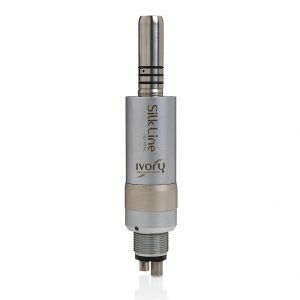 At Ivory we know very well that the engine is the heart of every machine and that, as such, it must guarantee maximum performance and precision. That is why the air micromotors Ivory silk Line delivers the best in class performance from a compact unit. Its innovative laminated rotor design develops torque similar to that of an electric motor while guaranteeing far superior reliability. Thanks to a speed of 20,000/25,000 rpm, simplicity of use, LED illumination and ultra-light weight, these micromotors are ideal for most kinds of operation. What you are you waiting for trying them?